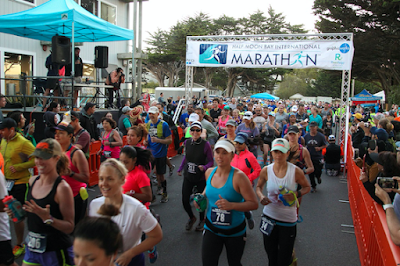 I was all smiles on Sunday morning as I snuck out of the house and drove towards the beach...after a two year hiatus, the Half Moon Bay International Marathon was back for 2016! When this race debuted in 2011, it magically captured so much of what I love about this coastal town...sandy trails along the beach, cute little neighborhoods full of friendly locals, the majestic Ritz-Carlton hotel jutting out over the bluff at sunrise, and of course, lots of local beer and fresh seafood at the finish. A perfect way to spend a sunny California afternoon! About 800 runners gathered for the Full and Half Marathon, and Race Directors Franz and Jen Dill sent the marathoners up the coastline just as the morning sun lit the trail. I paced along with Magdalena Boulet (just running again after her 5th place at UTMB), Nakia Baird (looking faster every year), Kristine Groteguth (Cal State Monterey 400m/800m runner), Kenley Gaffke (29th marathon! ), and a half dozen others as we tackled the trails and small hills of the first section. It was a casual pace, and I enjoyed catching up with Magda and hearing her take on the gargantuan Mt. Blanc (I think she will be back!). 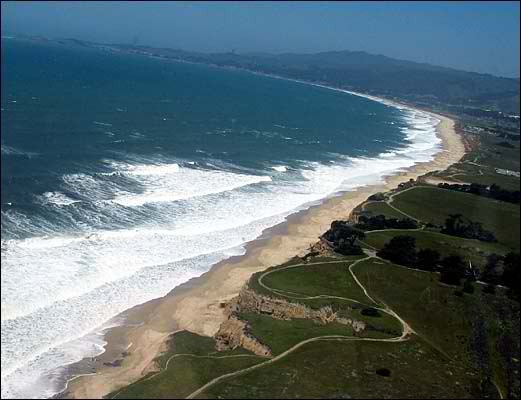 By the time we hit the Montara turn around (mile 4), there was less chatting as we all started to find our gears. Team Asics runner Gen Lin Foo was well out front, having gapped us all by two minutes, and I settled in around 6th place in a line of runners snaking through the tree-lined streets. The surfers were out in force as we hit the coastline (mile 8), cheering runners while waiting for the perfect break. It was an unusually sunny day here, so there was no way the locals would let a few hundred runners get in the way of dog walking, catching up with friends, and getting some beach time. 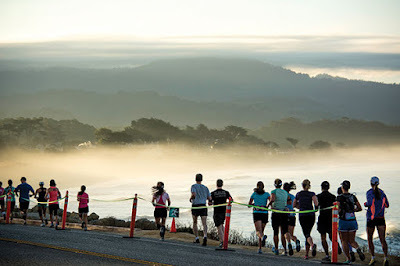 We began mixing with the Half Marathoners, and I used the orange singlet of Daniel Russey (3rd) from Arlington, TX, and the bouncing hair of San Francisco runner Shera Garung (2nd) to navigate the few changes to the course along the way. We hit the halfway (mile 13) in 1:26:40, and on an out-and-back section I saw Magda and three others just a minute behind. Can't let up now! The course had more road sections than I remember from the inaugural year, but the trails remained fun and fast. 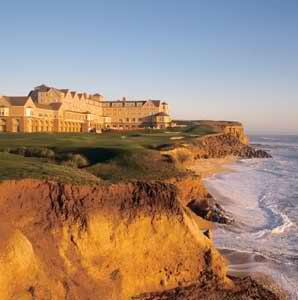 All the little climbs and zig zags were great to alternate the muscle groups, and I found I still had good legs after the turnaround at the Ritz-Carlton hotel (mile 18). 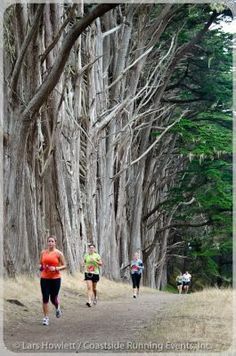 This course definitely favors the trail runners! My pace was holding at 6:30 min/miles, but so was Shera's about 30 seconds ahead, and I knew Magda could throw down sub-6 min/miles on any given Sunday (Oh crap! It's a Sunday!!!). Gen Lin Foo was long gone, so I decided it was a race for the podium, and if all went well, perhaps I could snag the Masters win from Shera too. GOAL...IS...SET!!! Go fast, but relax. Go fast...BUT RELAX!!! YOU'RE NOT RELAXING!!! The diatribe in my head made me chuckle...after all these races, my inner voice still screams at me to relax like an overbearing parent, with about the same results. It's easier to just cheer on fellow runners and breath in the salty air, so I focused on that instead, and soon pulled up on the shoulder of Shera (mile 23). He let me go by, clearly favoring one side as he worked through a cramp of some sort, but wasn't going to let me out of his sight. Super volunteers Sean Handel and Ron Little drenched me with water at one last aid station (mile 24), and I went heads down in hopes I could keep that Nepalese Master in my rear view. My girls Sophie (10) and Quinn (5) were beyond ecstatic. DAD WON! The newspaper and radio wants to talk to OUR DAD! Free Zola chocolate coconut water thanks to OUR DAD! (ha, ha) Even better, they got to meet Magda Boulet the "Mom Olympian" and see us get handed two oversized checks like a couple of pros. Somehow I had gotten just enough small town and just enough big time to impress the kids. You know what? I'll take it. Not sure how many hero days you get in a lifetime. And for the girls to meet an Olympian after watching Rio all summer? Who knows what that might inspire. The oversized check (aka "big check") turned out to be a lot of fun, and I had no idea how many perks come with carrying that sucker around. By the time we made it back to the car, we had been comped beer at Half Moon Bay Brewing Co, gelato at Mezza Luna Cafe, got pictures with tourists, and even met the famous big wave surfer Jeff Clark at his Mavericks store. Hooray for big check!!! 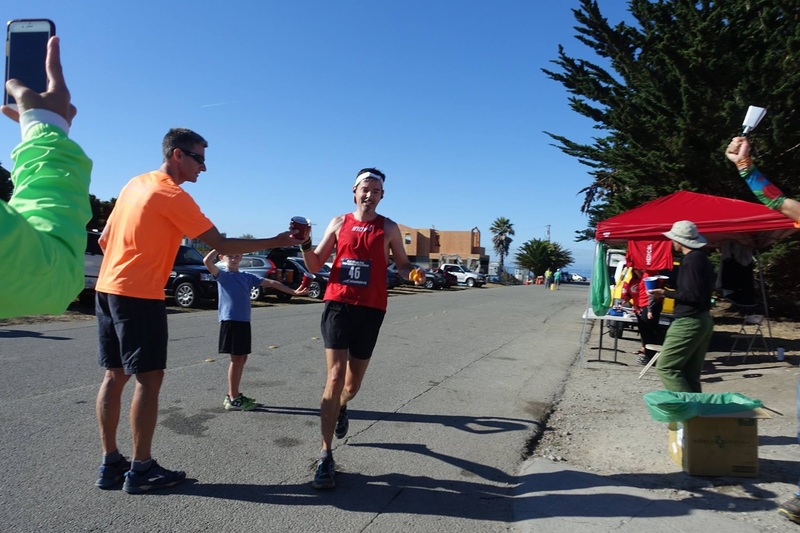 My thanks to Race Directors Franz and Jen Dill, their amazing volunteers and sponsors, and the community of Half Moon Bay for bringing this great race back to life. For the Dunlap family, this is a day we will talk about forever (well, I will anyway). I look forward to seeing you again next year! Oh, your kids are so cute! Yes, my wife Christi and I are both Oregon Ducks! GO DUCKS!!! Thanks for the photo.